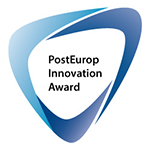 The PostEurop Innovation Award is organised through the Operational Activities Circle (OAC). It is inspired by the Innovation Forum, which seeks to create more awareness about “what’s going on out there”, and encourage Postal operators to design and build solutions, services and products that fully meet their customers’ needs. The objective of the award is to foster innovation among its Members in a consistent and continuous manner. Its purpose is to recognise, each year, which of our Members has managed to accomplish the most remarkable new developments (solutions, services or products) with distinctive qualitative and quantitative benefits (such as: cost reduction and/or accrued revenues and/or increase in customer satisfaction) to achieve sustainable results. The applications submission period for the 2019 Innovation Award was opened on 19 March, the deadline for applications is 24 May. Do you have a compelling Innovation to share? Please contact the Chair and Vice-Chair of the Innovation Forum!